See who we are. See all we do. Estimating Services – Southern Folger's Security Electronics Division maintains a staff of qualified estimators whose experience in the detention industry allows for development of accurate and detailed estimates specific to your project. Estimators typically work with Architects, Security Consultants, Owners, and other trades to ensure estimating accuracy. Scheduling and Coordination – The Project Management and Project Engineering Departments can provide full service coordination in order to continue or create a complimentary relationship with the Architects, Security Consultants, Owners, and other trades, and to perform all coordination necessary to assure a successful project. Engineering – Southern Folger's Security Electronics Division maintains a full staff of experienced, well-trained Electrical and Control Systems Engineers with emphasis on facility electronics. This department is focused on providing well-designed integrated systems that are easily installed and maintained. Systems Integration – Sub-systems are integrated into a single fully integrated control system. 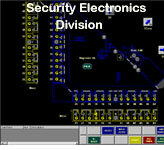 CLICK HERE TO VIEW SECURITY ELECTRONICS BROCHURE!